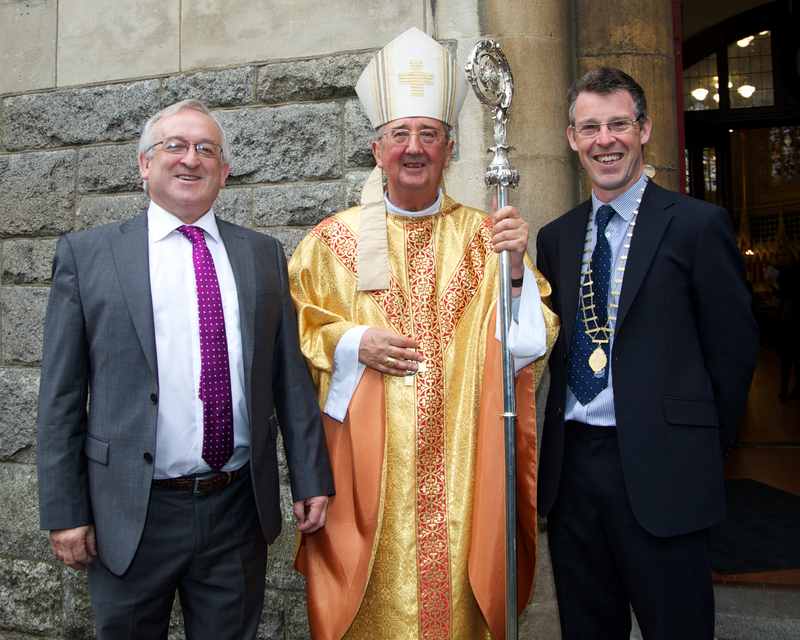 Michael Minnock, retired principal of CBS Synge Street with Archbishop Diarmuid Martin of Dublin and Cormac Champion, President of the Synge Street PPU. Synge Street CBS, the iconic secondary school in Dublin’s South Inner City, is looking for a new principal, following the retirement of Michael Minnock, whose 10 years at the helm made him the second longest-serving principal in the school’s 150-year history. Deputy principal Claire Catterson is acting principal at present, and the Board will start a new trawl next month for a new Principal. Offaly native Minock has decided to pursue a doctorate in Maynooth. It’s a subject close to his heart, as he came to a much-changed Synge Street in 2005. In its heyday, the school had a student population of 700, but for the past 20 years it has been a DEIS (Delivering Equality in Schools) school, with a roll-call between 250 and 270. Situated in a disadvantaged area, it is a constant battle to pay the bills. He was also very conscious that, despite its large number of Muslim students, Synge Street was a Catholic school, and he was anxious to retain its Catholic ethos. “All celebration events centred around the Mass,” he explained, “and I had Mass as part of my retirement celebrations. In this respect, Michael can point to a number of solid achievements during his tenure. “First of all, I like to think I have restored a little pride. The pupils are very conscious of their heritage, and the theme has been to blend the past, present and future. The cupboard was bare when Michael took over 10 years ago, so a lot of time has been spent on fund-raising. One of the most successful featured the Dunboyne Consort, of which he is a member, singing excerpts from Handel’s Messiah, which raised €6,000. One of the projects, which left him with mixed feelings was the school’s participation in an Immersion Programme, where he travelled with a group of boys to India. Michael’s final fund-raiser was the publication of the book, “Never A Dull Day”, to mark the 150th year. Sponsored by past pupil Brian McElroy, a funeral director, the book has achieved significant sales.